Last night’s NBA Draft on ESPN will probably have a 1.5-1.6 rating, which will make it the third-highest show of the night, behind only Hell’s Kitchen on FOX and a repeat Big Bang Theory on CBS. (Last night’s Draft tied ESPN’s highest rating since the network started covering the event in 2003.) The networks collectively sunk 10% below the same night last year, falling under a 5 combined rating. FOX: HELL’S KITCHEN was the #1 original show of the night, steady at 2.0. Also steady, but at a much lower level, was DOES SOMEONE HAVE TO GO? at 0.9. ABC: The NBA Finals played havoc with the network’s regular Thursday schedule, and WIPEOUT, MOTIVE and ROOKIE BLUE all aired for the first time in 3 weeks (and will be preempted again next week for July 4th). All were down, the first two by 0.3 to twin 0.9s, and Rookie by 0.1 to 1.1 (although the latter was enough to win the 10PM hour). CBS: The king of reruns did it again, with a 2.0 for BIG BANG THEORY at 8PM. 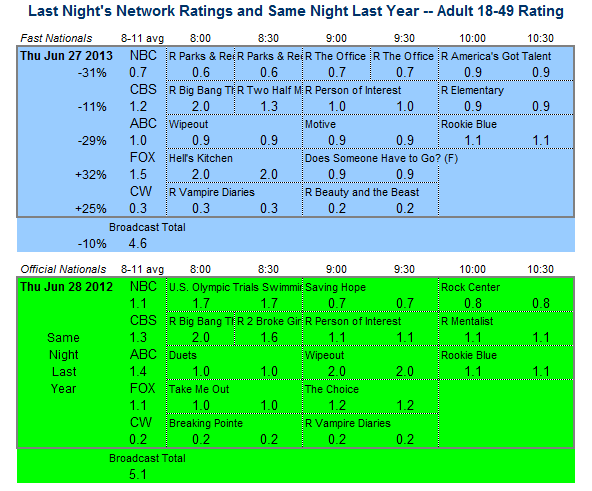 The 9PM hour was so weak that the network’s 1.0 with a PERSON OF INTEREST rerun was enough to win, and the rerun ELEMENTARY had a 0.9 at 10PM. NBC: An all-rerun night highlighted by 0.9 for AMERICA’S GOT TALENT. Another quiet Friday is in store, with the only fresh programming coming from newsmagazines and CW’s burn-off of its defunct CULT. Saturday has ABC’s burn-offs of ZERO HOUR and 666 PARK AVENUE against baseball on FOX. Sunday’s big event is on Showtime, where DEXTER launches its final season and the network premieres RAY DONOVAN afterward.